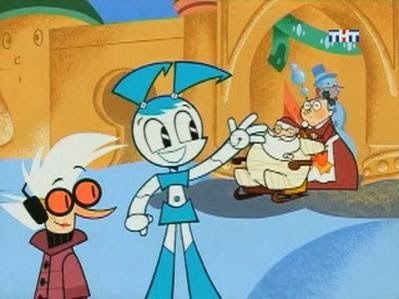 The episode opens with XJ-9 happily (if over-enthusiastically) filling in for an injured Santa Claus. She and her friends then hit the after-Christmas sales, where Jenny meets a little boy who declares that the only thing that will make him happy for Christmas is spending time with a real live robot. Always happy to help, Jenny goes home with the boy, but he turns out to be an evil brat with a plan to use Jenny to wreck Christmas. I won’t tell you the whole plot, but this brings us to a great section where we the viewers know most of what’s going on, because you and I recognize tropes, but the writers go farther than I’d expect for a Nickelodeon show, and there’s some real fear, tension and pathos here. I mean, I’m sure that the show didn’t ever refer to the huge, giant, massive things which happened during this episode again, because it’s not that kind of show, but it’s nice that they went there for an episode. In any case, the final climax falls a bit flat, but the obligatory song (reprised from the beginning) is really cute. And major props for using the word gay in a Christmas song in a kids show. We were pleasantly surprised by this show overall, and I recommend all you fans of sci-fi kids shows give it a try.